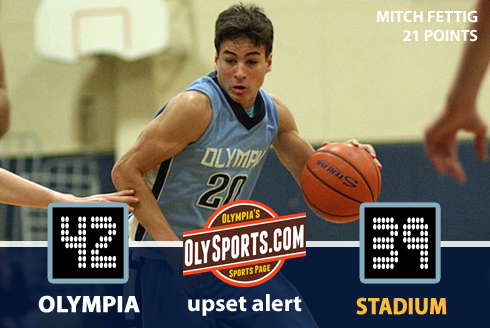 Mitch Fettig scored 15 points in the first half, tying Stadium’s first half team total, and Olympia held off first place Stadium in the final seconds to take home a 42-39 upset in Tacoma. Khalil Matheney added 12 points for the Bears who moved to 4-5 in the 4A Narrows. Fettig and Matheney combined for 33 of Oly’s 42 points but it was Max Fortier that hit a pair of free throws near the end to seal the deal. Only four Bears scored points in the game. Lucious Brown and Bobby Moorehead scored 14 and 12 points for Stadium, who dropped to 8-2 in league, still two games ahead of second place Yelm and Gig Harbor. Posted on January 29, 2014, in Basketball, College, High school, North Thurston HS, Northwest Christian HS, Olympia HS, South Puget Sound CC, Timberline HS. Bookmark the permalink. Leave a comment.